Now, what should you expect in increased revenue from these expenditures? That depends (the worst answer ever). Seriously though, it really does depend on many factors, however we would all agree that any employee should be bringing in at least what we are paying them, though that is not a great measure of success. It’s been said that a new hire should generate 2-3x their salary in new revenue or savings. No one wants to work harder just to break even! Harvard Business Review has estimated that 70% of the work force in North America is unengaged. That’s an amazing statistic. That means that while your staff may be showing up for work they are not giving you their discretionary effort. You are paying $100 and getting $30 in return (a crude analogy but you get the point). 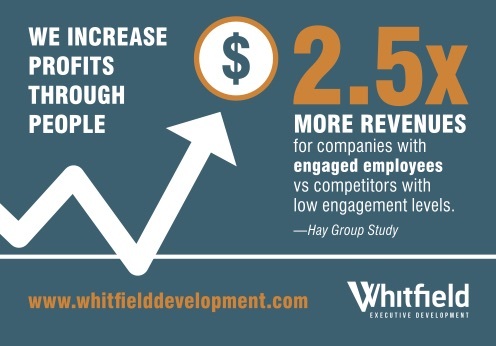 Imagine if you could increase your staff engagement by 5-10-20%. That means savings on lost labour, and it means your team is leaning in, offering more of themselves, their insights, their value! We engage your company leadership in the process of growth by building a healthy organizational culture where people want to give you more. Using assessments and coaching we help you understand your teams personality, areas of interest as well as needs, leading to greater trust, communication, commitment and growth. We train your front line leadership to be more effective team leads, not just individual contributors, thus maximizing everyone in your business, not just the few. Coach and support key leaders in sustaining a healthy culture over the long run.